As the saying goes, if you don’t like the weather in (insert region here), just wait a few minutes. In the past, weather broadcasters had few issues keeping up with fast-changing weather. After all, the only things used in a traditional newscast’s live weather segment were a person and a map. More recently, people became accustomed to having screens everywhere, and didn’t bother to wait for the newscast at all. With nothing more than a quick scroll through their desktops, tablets or phones they got the current temperature or the forecast in moments. But fast-forward to today, in a technology landscape where access to information is evolving as constantly as the weather. People are more connected than ever, getting updates from their own circles of friends and wider communities across multiple media platforms. The Weather Company, an IBM Business, has kept pace with global trends. They are the world’s leading provider of platforms and services that leverage weather and related data to help businesses make informed decisions and take action in the face of weather. They own the consumer brands The Weather Channel, which includes weather.com and the mobile app, and Weather Underground. Its producers seek to make weather coverage as personal for anyone watching it as it is for the people experiencing it in the moment. And they’ve discovered that it’s all about making new kinds of connections. After all, the weather is a subject that huge swaths of the population like to bond over, far beyond the everyday icebreaker. Extreme weather events are experienced—and shared—on a profoundly personal level. Robinson himself has adopted the habit of browsing on Facebook Live whenever there’s a storm that’s just been named, or a land-falling hurricane about to roar ashore. “You can find a map of people who are streaming live at that moment. When I click on the people in a particular location, I can see exactly what’s happening around them, in real time,” he says. He browses through the streams, and if he finds something they can cover, he’ll tell his team to look for video from that area or locate someone who can capture footage locally. This is a dramatic difference from browsing through local weather station data to see numerical rainfall measurements and wind gust data. At first, bringing these digital, more spur-of-the-moment media types into a production came with some challenges. That’s because The Weather Company previously used traditional video production facilities that it shared with The Weather Channel TV Network, the Atlanta, GA-based cable television channel. The Weather Channel TV Network was not acquired by IBM in 2016. One, the baseband infrastructure was not easily adaptable to workflows that relied on digital media, as weather.com’s increasingly did. And two, connecting cables in order to route video anywhere meant that the team couldn’t simply spin up a new digital source at a moment’s notice. Instead, bringing in social content required a bit of advanced planning, equipment and expertise. “We would discover excellent user videos on platforms like YouTube, but anything we found would already be a day old, or several hours old,” Robinson says. In other words, by the time they could bring it into their production, it would no longer be the up-to-the-minute, breaking weather they relied on. So they had to limit their new ideas to whatever they could make work in a traditional broadcast workflow. “We had to fight a constant infrastructure battle, trying to do new things and connect new systems that weren’t compatible,” Robinson says. But in 2017, after The Weather Company was acquired by IBM, Robinson and the rest of his team—no longer under the same ownership as The Weather Channel—moved into new facilities, and with the new building came a clean slate. He had gotten interested in IP-based video near the end of 2014, but thought it was out of reach for what The Weather Company wanted to do. It seemed expensive; the technology was complicated; it was a big disruption compared to video routers. But in 2015, when the digital video staff was using NewTek TriCaster® for live production, NewTek released the NDI® technology for video over IP that could be incorporated into the TriCaster workflow. They experimented with a few inexpensive NDI software applications—NewTek ConnectPro (making sources on an IT network available as NDI video for production) and NewTek NDI Telestrator (freehand drawing on video, over the network using a mouse, stylus or fingertip)—and were astonished at how simple NDI made connecting their digital sources to live video. If transitioning from a traditional baseband facility to an all-IP one seems like an intimidating prospect, Jim Robinson and the digital video team didn’t see it that way. “I told my team, ‘We’ve got a great new space in our building, The Digital Weather Center. You’re going to walk in, it’s going to feel like you’re on the same equipment in the same setup, and everything is going to look the same,” says Robinson. 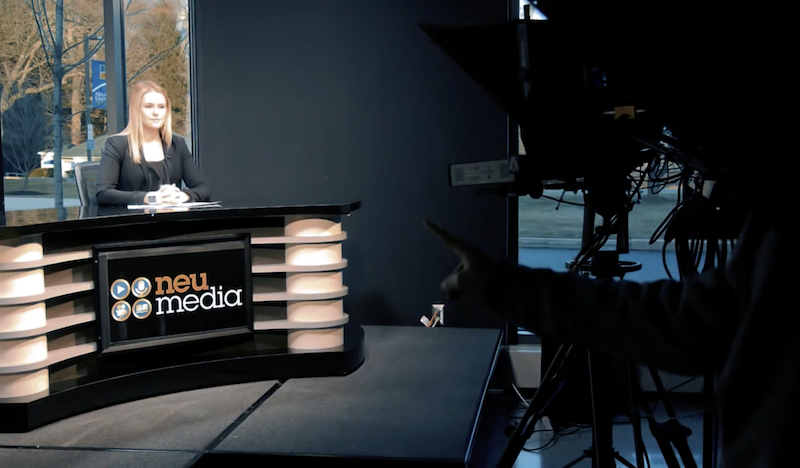 It was equipped with gear they already used, he told them—in fact, the very TriCaster 8000 that they used in the old studios, along with a NewTek IP Series 44-input live production system sharing the same familiar software UI. 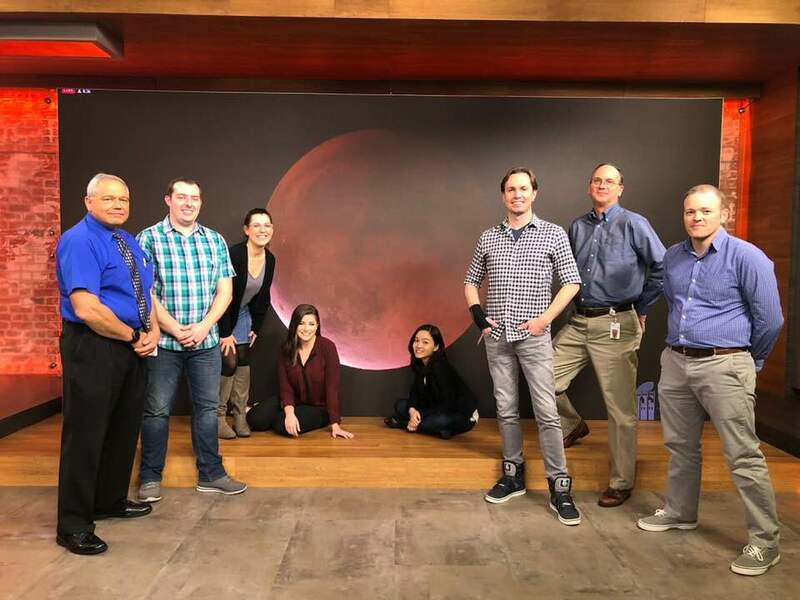 The Weather Company had its inaugural live stream production from the new facility on January 31st, 2018 during the total lunar eclipse, putting all the systems in its IP workflow to the test. That also was the day they realized the workflow would constantly change, based on any situation that could come up. “There are big weather events, natural disasters happening all over the world, and we have to be able to accommodate every kind of scenario,” says Robinson. 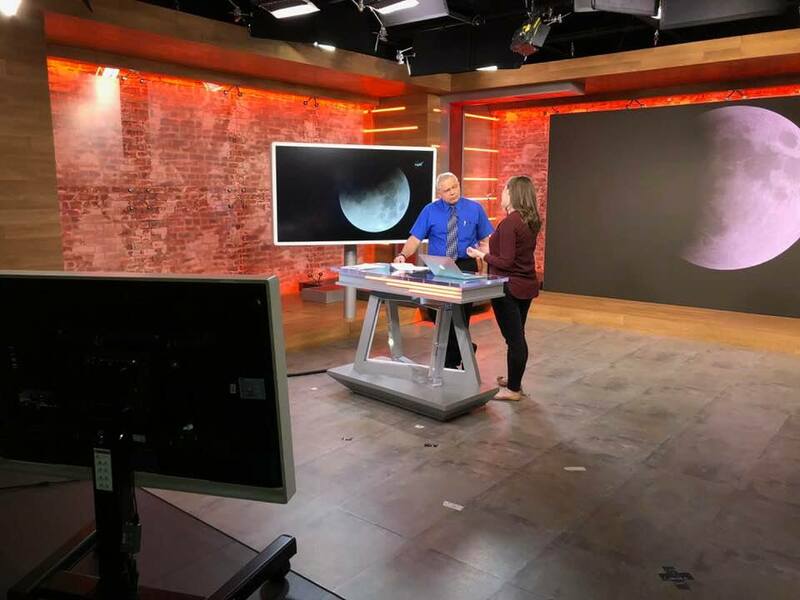 On the evening of the lunar eclipse, they realized that to stream live video to the app, redundancy across both studios and both control rooms would be vital. “If we lost power, if someone tripped over a camera, anything could happen. We needed to be ready to recover if we had to,” he says. Using NDI software applications, within moments they modified some options, and instantly could switch between Studio One and Studio Two to stream to the app. The impact of IP production extended beyond live switching, too, because NDI technology enables all devices to communicate with each other over a network (not just transmit one-way sources to a centralized switcher). For the lunar eclipse program, the team gathered all the NDI signals, forming a virtual IP-based “router,” and used it to power their video wall and all of their monitors. They also easily routed the feed from the app back into the network using NDI—meaning they could monitor the actual user experience during the live stream instead of just seeing the program out. Just before sunrise on January 31st, the world was treated to the celestial spectacle that was the total lunar eclipse. If they had The Weather Channel app on their smartphones, stargazers didn’t even have to leave the warmth of their beds to witness it. In the Atlanta studios of The Weather Company, the mood was nearly as serene—at least compared with traditional baseband production. Having to cover natural events big and small—and local, national and global—Robinson is fully aware of the adage about how quickly the weather changes.